Could Mars one day have its own ring? Some scientists are saying yes. 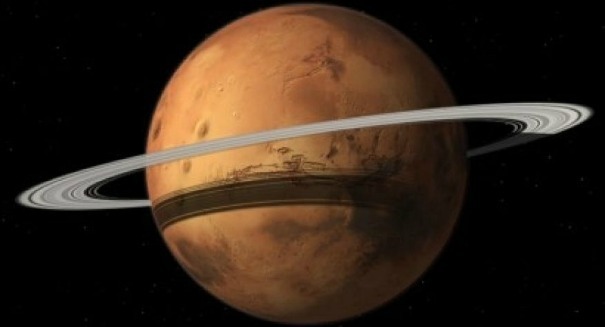 Here’s an interesting claim: Mars may get its own ring. Where will that ring come from? The Red Planet’s largest moon, Phobos, which is expected to break up eventually, which could mean a lot of things — but researchers at UC Berkeley say it will be turned into dust and create a ring of debris around the planet, according to a Fox News report. If so, that would make it the fifth planet in our solar system to get its own ring of debris, joining Jupiter, Uranus, Neptune, and of course the most famous and visible of them all, Saturn. Scientists have noticed that Phobos is starting to break up, but there have been a variety of theories on exactly wha twill happen when it does. Theories include the one mentioned, as well as the possibility that Phobos would smash into Mars. However, the researchers, who published a paper in Nature Geoscience, said that if the moon broke apart at 680 kilometers above the surface, it would form a narrow ring comparable to that of Saturn, and it would get wider over time. In a few million years, it would reach the top of Mars’ thin atmosphere, and at that point the debris would start raining down on Mars. Would Mars look like Saturn? Probably not, at least from our perspective. The dust likely wouldn’t reflect sunlight as much as Saturn’s rings do. Plus, it helps that the rings of the outer planets have a lot of ice in them that reflect more sunlight, which Phobos does not have. Still, the ring might make Mars itself brighter as seen from Earth, and the rings might appear as shadows if you viewed through a telescope. Of course, don’t expect to be viewing this yourself. Such an event is tens of millions of years in the future.